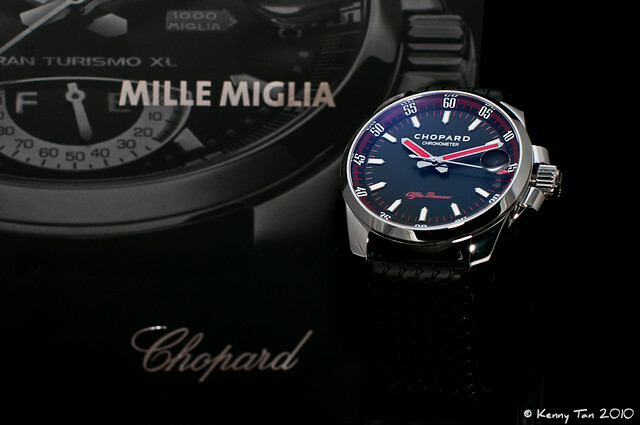 This is a Alfa Romeo limited edition Chopard watch and limited to 750 pcs world wide. What i like about this watch is that it got almost everything i needed, GMT function, Chrono, 42.6mm size, decent branding and of cos the critical draw being the Alfa Romeo anniversaries commemorate. Very cool. My Chopard GT Alfa Romeo says hi! That makes us a family! Thank God for Nicola Romeo!! Very nice! I love Chopard watches! Chopard do produce very good quality watches! Enjoy urs! This is exactly the same emblem on the grille of my Alfa Romeos - the Giulietta, Alfetta and GTV..these are the classic models where they were manufactured in Milano plant. hi dont mind.. how much did you bought your watch for.. its really really beautiful.. thought of selling it?